(Newser) – When Washington Post data journalist Christopher Ingraham wrote a column about the best and worst places to live in America last summer, he had no idea how much his life was about to change. In addition to deeming Ventura County, Calif., the most desirable county based on a "natural amenities index," he named Red Lake County, Minn., as the "absolute worst place to live," sarcastically noting its claim to fame was "it is the only landlocked county in the United States that is surrounded by just two neighboring counties." 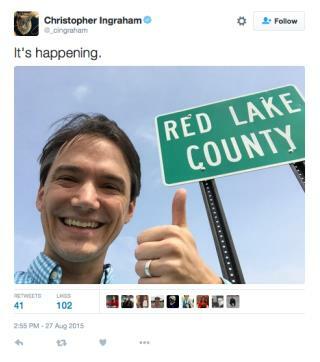 And when outraged Minnesota residents (or as Ingraham called them, "Indignant Minnesota Twitter") took to social media to attack his description, sending him photos of scenic landscapes and painterly sunsets, Ingraham simply doubled down in an update two days later, saying residents there had "thin skins" and that he didn't hear people from other low-ranking states complaining about his write-up. imagine ... a reporter getting something wrong ... who'd a thunk it. I find a lot of ignorant bashing of 'Red' states common among my friends and other 'Democrats', as well as the same, although not as much from the conservative friends I have. The fact of the matter is the whole of the US is an extremely diverse and beautiful country, which has a standard of living among the best in the world, even if you're poor. I hate cash and pu$$y. Sure hope nobody tries to convince me I'm wrong and send me free samples.